This is my solution to the arrival of challenging weather. Today it is rainy, not cold, but just rainy and a bit gloomy. So whenever I look outside, I visualize one of the places we visited when we were in the West and Southwest earlier this fall. I have lots of variety – I can imagine standing on the trail winding through the red rock formations in Utah, or feel my feet planted in the desert surrounded by saguaro cacti in Arizona, or imagine I am relaxing in these steamy pools, surrounded by the Rockies. And what amazing pools they are. I’m not sure it’s the place I would like to be in the middle of summer vacation, but on a cool and cloudy Sunday evening in October, it was a grand experience. The water is supplied by the mineral-filled Yahweh Springs, the water so hot at 122˚F that cold water needs be mixed with the spring water to make it a balmy 90˚in the large pool and a relaxing 104˚ in the therapeutic pool — which is smaller, but still the size of a typical community pool. Three and a half million gallons of mineral water run through the pools every day. 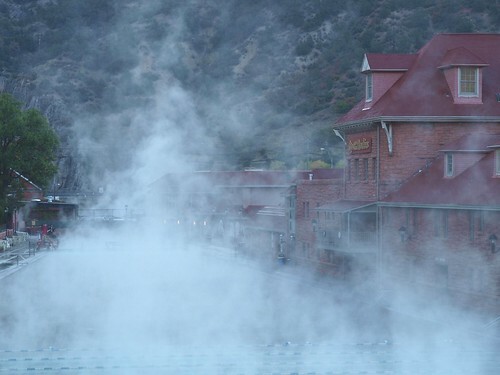 Originally built in 1890, the Glenwood Springs’ Hot Springs Pools have seen their share of celebrities. Al Capone, Titantic-survivor Molly Brown, and President Teddy Roosevelt have all been satisfied visitors. I was happy to share the same experience, and today I’m remembering the splash of the hot water and how all the weariness from a 10 hour travel day seemed to melt away. Now I plan to use those memories to wipe away the weariness of inclement winter. Believe me, Ron, if I could, I would! I may end up following in your footsteps as I’m taking notes about all the places you visited while I admire your photos. I’ve had a strong desire to travel lately. Robin, I consider myself a class A tour planner. Been known to research and plan 2 week vacations for 6 months or even longer. I think it may be a sickness I get about January. 🙂 If you have any questions, let me know. Yuk! It’s cold here too and I would love to be in that pool this very minute. This is beautiful and it sounds just wonderful. It is very rainy here too but fairly warm today. Even though it is not cold that looks very inviting. Nice shot! We have a hot springs about 20 miles from here and with the weather that’s coming in, it’s starting to look good too. that’s not the sort of picture you see everyday. The fact that Molly Brown visited really caught my fancy. I wonder if it’s changed much since she’s been there?